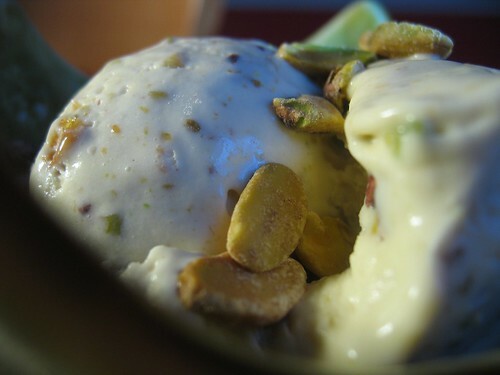 The way to avoid those pesky shells: Pistachio crunch ice cream. There’s hardly a happier sound than the sweet song of an ice cream maker churning. That song was playing in my house last night. Its delectable finish? Sweet, creamy pistachio ice cream. Yes, folks, my husband has done it again. There must be something about homemade ice cream that makes it that much more addictive than ordinary store-bought ice cream. How do I know this? Because I am tempted by flavors whose siren song I rarely hear in the heady bright lights of an ice cream parlor. When I amble up to that counter, I almost always ask for mint chocolate chip. 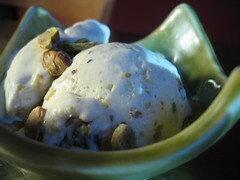 At home, though, I’ve learned to love ginger ice cream and now pistachio ice cream with almost equal fervor. I think I have a problem… and it doesn’t bode well for my waist line. It’s OK. I’m cool with elastic-waisted pants as long as they’re accompanied by steady scoops of this pistachio ice cream. The creamy custard itself is delicious — almost achingly sweet and buttery — but it’s the ice cream’s texture that seals the deal. 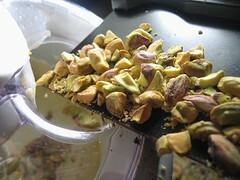 The nutty aroma of pistachio is laced throughout, and better still, so are nibbles of the nut itself. So amid your sweet creamy experience comes a wonderful and unexpected crunch. Trust me — and my clown pants — it’s good. Oh yes, it’s good. Pistachios are completely confounding to me. When I was a kid, they were red. Apparently, when they were first imported to the US, they were dyed to cover up flaws in harvesting and to make them stand out in vending machines. When I was older, they were green. Finally, I started eating them, I felt I needed the skills and tools of a catburgler (or at least an engineering degree) to open them. Luckily, they are so good I could careless. I love pistachios. After pecans, they are by far my favorite of all nuts. 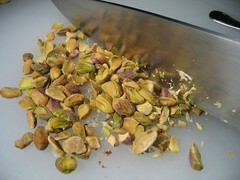 Pistachios have such an intense flavor. They are savory, sweet, salty and buttery. Heck they have to be that good if you have to pick through that shell just for half a bite. 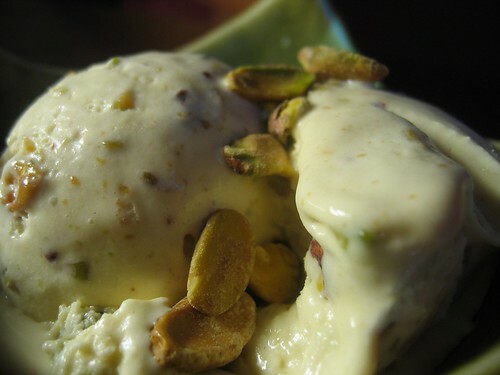 And pistachio ice cream is even better. It avoids all of the mischief of that darned little one that refuses to let go. 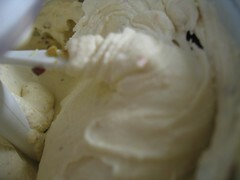 It also gives you an intense sweet and smooth flavor of ice cream combined with the crunch of the nut. This is likely my favorite of all ice creams I’ve made so far. So skip the broken finger nails or the chance the police might suspect you are an enterprising felon, and buy shelled pistachios and make ice cream! 1. 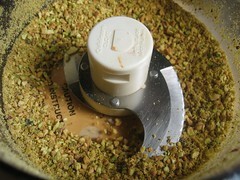 Using a food processor, pulverize 1/2 cup of pistachios until they are close to consistency of a gravel-like cornmeal. It does not need to be like flour, but there shouldn’t be any large pieces. 2. Time to make a double boiler if you don’t have one. Fill a medium-sized pot or saucepan with about an inch of water. Find a metal or glass bowl (something heat resistant) that sits on the pot high enough so that it doesn’t touch the water. This is a double boiler. This recipe can be done without a double boiler, but this set up prevents the eggs from cooking. 3. 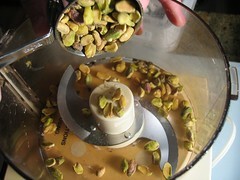 Once the double boiler is set up, pour the cream into the bowl, add the salt and pulverized pistachios, and heat over medium high heat. 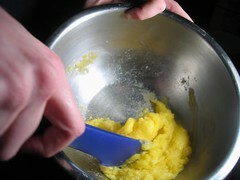 Whisk the mixture regularly to prevent a skin from forming. 4. 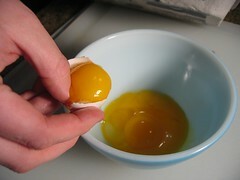 In a large bowl, whisk together the sugar and the egg yolks. It will come together as a thick paste. This step is important because you are going to add hot cream to this later and the sugar minimizes the chance of curdling the eggs. 5. Time to temper. Tempering also prevents the eggs from cooking by slowly raising the temperature of the eggs. This is done by ladling part of the hot mixture to the eggs while whisking, and then adding the warmed egg mixture to the remainder of the hot mixture. Now apply to apply it here. 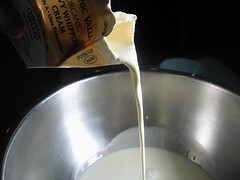 Once the cream reaches about 140F, remove the bowl from the double boiler. 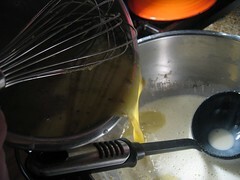 Next, begin to ladle about 1/2 cup of cream at a time into the eggs while whisking. Continue until you’ve moved about half of the hot mixture to the eggs. 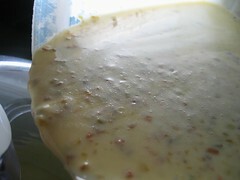 Now, add the egg mixture to the hot cream and return to the double boiler. You’ve now tempered. 6. Continue to whisk and heat the mixture until it thickens or reaches 160F, which ever comes LAST. This is import because 160F will ensure there is no salmonella, etc in the mixture. 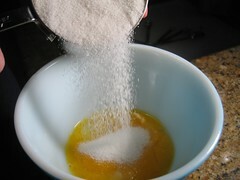 The thickness of the mixture should be enough to coat the back of a spoon. 7. Place the cream into a container and cover. Place in the refrigerator overnight or in the freezer for 2 to 2 1/2 hrs (check at 90 min as your freezer may be colder than mine). 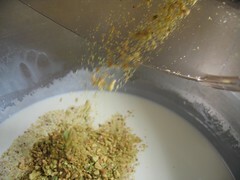 It is better overnight, but the goal is to get the cream as cold as possible before churning. This will enhance texture. 8. 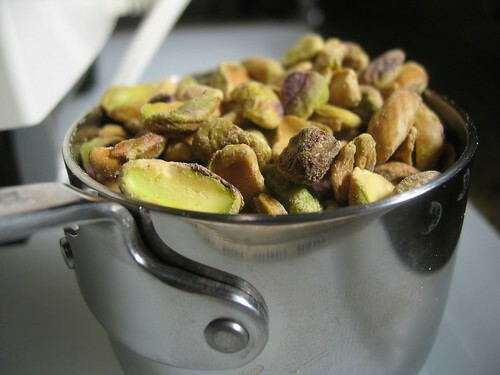 Once the temperature on the mixture is cold (bellow 40F), add it to your ice cream machine along with 1/2 cup of crushed or chopped pistachios. Churn the mixture until it is at least soft serve consistency. Once done, place in freezer for at least an hour to firm up. Serve. Enjoy! Bring on the elastic waistbands, I want some of this ice cream! *chuckle* I can say this is hands down my favorite ice cream I’ve made. I know I say that in the post, but in all honesty it’s so good. I am not ashamed to compliment myself and my own cooking, but this one surprisd me and I’m extemely proud of it.